Firstly a request from Tim of Delamere Spartans asking if Helsby could help them out with some marshalling at a race they’ve been asked to organise as part of Manley Spring Fair on May Day Bank Holiday. The race will be a 10k race from Manley Village Hall on Bank holiday Monday the 6th May 2019. It will go out to the Forest via Manley Common, around the Kingsley area of the Forest and back. We are looking for volunteers to help on the day with Marshalling. We are having a child’s race at 11:30 around Manley Common and an adult race at 12:30. We require Marshall’s for both so any that are in the Forest will need to be available for a few hours. I can’t promise any food or refreshments but am working on it and they will be allowed free entry into the Spring Fair that is taking place at the same time. If anybody is interested please will they give me a call and email. Another great turn out for race 4 seen 38 Helsby runners make the short journey over to Tattenhall to race around their 6 mile undulating course on a very windy day which made the conditions pretty tough to race in, 372 runners in total battling the elements. Hannah Cowley made it her 3rd win this season in the ladies competition, with Alison Halsall coming 1st in the FV45 category. The ladies were 3rd on the day and sit 3rd in the league table just 22 points behind 1st place with 3 races to go. Paul Frodsham turned back the clock with a run coming home 2nd in MV60 category for the men, which seen a best finish of the season so far on the day, also coming in 3rd, with some great performances all round. The men strengthening their position in the top flight now remaining in 5th but pulling away from the relegation zone, and just 101 points away from 4th place. A full month off now until the next one on March 3rd over in Birkenhead park. Two Helsby pairs met in the dark for this weekend’s Marmot Dark Mountains, based at the splendid Lowther Hall in the eastern Lakes. A race that bills itself as a 2-day mountain marathon squeezed into one night, this one seems to be as much about preparation and managing yourself as about speed. A slightly less glorious finish for Jake Holmes and Steve Riley in the B class, who struggled to find one of the cheekier checkpoints (hey, it was dark!) in the worst of the night’s weather. The wet snow and the search in the cold and dark started to bite home and the emergency bivvy sac was broken out to put every bit of clothing on and stuff some more food down. We cut our race short and dropped down to valley level to get back to safety, tails between legs. An adventure was had. Firstly, apologies for the missing/ late blogs over Christmas and New Year. Please contact Chris Fitzpatrick for further details. Here are the consolidated results for Helsby from New Years Day, also, the previous week Rebecca Tate won her age category at Delemere. Thanks to those who came along to the Xmas Handicap last Wednesday. Well done to Steve Wiggins who won the handicap cup & Kevin Smith who ran the fastest time overall. . The Cheshire champs xc is on Saturday 5th January 2019 at Birchwood Forest Park Warrington. The club will be entering members for this race. So if any of you would like to enter please respond on this page or send me a email to mooeyf@hotmail.com no later than Friday 21st December. We will send a separate email this week. Being on my own, I took my old Saab for a good long drive down to Cardington. Even its rally heritage couldn’t deal with the field that was reserved for parking, as it promptly bottomed out on the huge muddy ruts in the gateway. This offered a taster of just how the day was going to progress. All fell races require a degree of navigation; and this one was no exception. Not the course – which was well marked and marshalled – it was finding the village hall to register – I didn’t know where I was going and like a silly sausage I followed signs that said “Start” which led me to a field. Registration complete, the traditional pre-race toilet visit was necessary. This time I was definitely going to ensure correct navigation, and upon seeing a large queue of men, I assumed there was one single toilet, and asked if this was the case. Bizarrely, it was not and the adjacent room with virtually no queue was in fact the ladies’ loos. This caused much cackling as to the reasons why “Once the men are in there, they’re in for a good 30 minutes” giggled one lady; “Yes they’re probably reading the Sunday Times” cackled another. Quick registration, hardly any loo queuing – all odd but very welcome. So, off to the start field, where groups of people who knew each other were shouting congratulations at each other for having won tons of other races. Not unnerving at all. And there were the usual sinewy blokes running about eagerly in the cold wearing next to nothing. I positioned myself next to an intriguing looking gentleman who was not only stretching but appeared to be adopting a variety of standing yoga poses, in his Inov8s, in a field. I never saw him after the start, so I guess it worked well for him. But then I’m also very slow. There were 271 of us, and off we trotted across a field. What a waste of time that was – on the other side was a stile, which is worth getting there early for, because otherwise you politely queue assuming that you’ll go over the stile in order of arrival, but as is often the case a whole bunch of men who generally look like Jeremy Corbyn decide that having ambled slowly over the field, this is a great time to make up 50 places by sauntering right past everyone who got there first (by running quicker as in the spirit of a foot race), and brazenly pushing in at the front. Thus seething, I carried on. There was next a “green lane” type of path, which was actually a muddy stream, to ensure that for the next 9 miles we’d have squelchy feet. Then through a bog and up a massive hill. It went on, and on, and on. Then came the slippery yellow moss. The best way was actually on hands and feet it was so steep and slippery. Here I observed the next source of annoyance: people who ignore the instructions and don’t carry any kit whatsoever. What a great weight advantage it must give them, and apparently without any consequences as I’ve never seen kit checks at any fell races I’ve been to. After an age, we got to the top and here the wind was crazy, and blew me sideways. Learning to run leaning into the wind along the ridge, I tried to admire the spectacular views whilst staying upright, and then down a sharp downhill towards another hill that was shaped like a traffic cone. Inevitably that was going to be next on the route. Up we went. Actually I don’t have much memory of this one. I think it’s buried deep in my subconscious and I might wake screaming tonight as it all comes flooding back in my nightmares. Let’s just summarise the rest of it as bogs, muddy tracks (I’m talking shin deep) with no way to avoid the stuff, a stream, woods, more hills that took a very very long time to go up, more slippery yellow moss. Just as I was thinking how good my fell shoes are on a downhill bit, my feet slid from under me and I went over backwards. To add insult to injury I actually bounced, and landed twice. Let’s put this down to the springy nature of moss; it couldn’t possibly be having a massive bottom – my glutes of iron could never have afforded a bounce like that. Surely. Seven miles in the constant uphill was really hurting my right Achilles now. It was relentless. I just wasn’t feeling it today, having started out grumpy, what with the cheating queue jumpers and kit avoiders. I seriously considered finding a marshal and bailing, I’d had enough. But my Garmin beeped telling me it really wasn’t far now so I carried on, and the ground levelled out to be more undulating but still with standing mud pools and clay pools to run through. Although the same distance as Clywdian hills and slightly less elevation, this felt a lot tougher. The final field couldn’t come quick enough and there it was, all done. Looking back, the scenery was amazing and I’d love to go back and run it more casually, stop to take in the views, on a nice summer day. But today it was brutal. Back to the village hall where they served lovely soup, tea and cakes. I came 242 out of 271, not a great result, especially when compared to the first lady who did it an hour quicker and was 9th overall, taking a new course record! Mercia Fell Runners put in a really strong performance, taking 7 of the top 10 places, with a huge turnout overall. Firstly a message from Paul Foster regarding the upcoming XC fixture. This event is pre entry, so if any Helsby runners would like to run in this. No later than Monday 5th November to confirm your entry. It is free to all Helsby first claim members. So to all the regulars and new members Best of Luck but please check your diary before entering. Richard Hankins & I took a trip to Switzerland last weekend to run the Lausanne half marathon, together with Richard’s brother Mark, a Swiss resident. I’d seen this race advertised while on holiday earlier in the year and decided to give it a go. A nice t-shirt and medal are included. In fact this was my third visit to Switzerland this year. The half was one of several races on the day, there is a marathon option, a 10k, a walking race and even a Nordic walking race! Pre-race preparations included the usual carb loading session on Saturday night. This was at the excellent Va Piano Pasta restaurant in Lausanne. Together with the extended Hankins family, the venue certainly proved quite an experience. The half marathon starts in La Tour-de-Peilz near Vevey and follows the smooth well maintained closed main road in a westerly direction. This took us back to Lausanne along the banks of Lake Geneva to finish in front of the Olympic Museum. Lausanne is where the International Olympic Committee HQ is based. Race entry gives you free travel on the train to La Tour. The race unusually didn’t start till the afternoon. This was a bit of a pain because of waiting around in the cold, but at least the rain had stopped by then. The afternoon start is because the half follows the marathon runners along the same route. The organisation of this race was excellent, the route is very scenic, with views across Lake Geneva towards France and the Alps. There are many vineyards along the steep south facing slopes on our right most of the way. The road sweeps round a lot of gentle curves, with dips and rises giving the impression it was rarely flat. We both thought the course seemed harder than we were expecting. It was also very cold on the day, I struggled to stay warm which wasn’t made any easier with a noticeable headwind at times. The half marathon wasn’t a mega huge race either, just 4,328 finishers so it never felt very crowded on the course. There was a penned start to segregate the runners, some being held back for quite a while to create more space. It was a lovely weekend with lots to see in Lausanne, the Olympic museum being outstanding and well worth a visit, admission 18f. Everything the Swiss do, they seem to do very well. Myself, the captain and Hannah had been selected for “The Shire” for this one, this race being the opposite of the last one we did together in Meerbrook which was super hilly, this one being flat as a pancake apart from the caravan park hill for a few hundred metres around mile 3, but what goes up must come down, so it was super fast coming back down. The weather forecast had been looking grim for this one, but once we got to Abergele the winds had died down and the rain had disappeared. The issue with this race is the first 2 miles are super flat and super boring, the course being an out and back along coastal path, up the steep hill and around the caravan park to come back on yourself. If you go out too fast on the first mile your screwed which is exactly what i did. The North Wales guys we were competing against where super quick, so me thinking i’m running pretty well at the minute decided to go with them, and got taught a bit of a running lesson, after the first few miles i wanted to give in. Myself, Louise, Nathan Woods and Tracy Woods all ventured over to Halewood on Saturday for the monthly 5k. Excellent organisation as always and conditions were very good for fast times, I’d be rabbiting on about how fast this course was so I was a bit nervous that I’d oversold it but luckily Nathan and Tracy both smashed it with a PB each coming in at 17:22 and 25:54 respectively. Superb running guys! Thank you to Louise for the support and photos, the full results can be found at the link below. Morning all, just a week to go before the Borders League season starts next Sunday. You all excited? I’m going to order some more hoodies as it seems winter is here. Unfortunately, the price has gone up, so the next lot will be £18. Please let me Sue Buck know the size as well. The last time I ran a marathon was in London 2013, over five years ago. At that particular time I was aiming for the coveted “sub 3” which I managed to get (just) and I swore I’d never do another one, the pain of that race is still etched into my mind to this day! I stuck to my guns on this until recently when Louise got sick and I wanted to do something to give back to the unit who cared for her last year. I’d heard good things about the Chester Marathon, although not the flattest marathon around the organisation always gets great reviews and it’s right on our doorstep, so my place was duly booked and training started. I decided to follow a specific training plan this time from a book called “P&D Advanced Marathoning” I’ve never followed a plan before but seeing other runners I know successfully follow the plan and set themselves big PBs, it seemed like the logical thing to do. So my 12 week training block started back in July and I had my ups and downs with it. We had one of the hottest summers on record so most of my training was done late at night, I also developed plantar fasciitis in the second week which I had to train through and I then hurt my achilles in the final week (on a treadmill in work for charity believe it or not!) but I managed to stick to the training sessions as best as I could and arrived on the start line relatively injury free. I think following an intense training plan with weekly mileage up to 70mpw was always going to be a challenge and I expected to pick up little niggles along the way. The course takes you through Chester City centre, over the River Dee and out towards North Wales, then back to Chester with a finish at the race course. It was a nice route, gently undulating through country roads and it looped through some beautiful little villages where the locals came out to support which was nice to see. At the halfway mark everything was going to plan, I had stuck to the required pace and fuelling strategy I’d practiced in training (gel block and water every 4 miles) and was feeling great at this point, I breezed through at exactly 1.22.30. Things were pretty uneventful until I hit a hill at 16 miles and the pace dropped, I also started feeling some pain in my achilles which had been bothering me in the final week of training. After this point I just couldn’t maintain the required pace for target time and as the miles ticked by I could see the pace dropping further and further. Time for plan B! A quick mental calc and I realised if I could hang on I would still be in with a shout of sub 2.50, I then passed the 20 mile marker and I entered the dreaded final 6.2 miles! It doesn’t matter how much training you do, nothing can prepare you for those final 6 and a bit miles of hell in a marathon! It really becomes a mental and physical battle, I was desperately trying to keep the pace below 6.50 per mile and my achilles was getting worse and now the course was getting more hilly. I stopped looking at the watch and just concentrated on my gait and stride which I adjusted slightly and things settled down a little. 22, 23…then mile 24. I’d heard about the “huge hill” here and it didn’t disappoint, with 24 miles in the legs it felt like a mountain! It’s there that I heard a big cheer and someone shouting my name, I looked over and Gaz O’Connor and Helen Owens were at the top of the hill, I think I managed a small wave (sorry guys!) but it gave me the boost I needed and from there I managed to hang on in the last 2 miles and finish in 2:48:56, a ten minute PB! I was elated! My mum and Louise were there to greet me at the finish which was amazing! Fitzy managed to pace the sub 3 group perfectly finishing in just under 3 hours and we had some other fantastic results from the Green Army. Neil Finegan finished in 3:05:15 as he prepares for the Snowdonia Marathon and Spiderman finished in 3:54:51, well done mate. Ben Williams also had a strong run to finish in 4:12, not quite the sub 4 he was hoping for but I don’t think Chester is the best course to go for a PB and I’m sure he’ll achieve it on a flatter course. So in summary it was one of my most memorable races, it’s always nice when you work hard for something with months of training and it pays off on race day. It also helps to have a very supportive and understanding partner, Louise has been my rock these last few months, even when I was nipping out at 10pm for a 20 mile run she never complained! The best result we got from the day was the amount of money we raised for CANtreat though, over £700! Thank you to all members who donated it really means a lot to us. We have entered 3 teams in this year’s fell relays which will be held on Saturday 20th October in Grasmere (the Lake District). For those of you who are new to this event, it is a relay event staged over four legs the first and last legs are solo affairs (this year between 4 and 5 miles), the second leg is a pairs leg (about 7 miles) and the third leg is a pairs navigation leg, so teams of 6 runners. 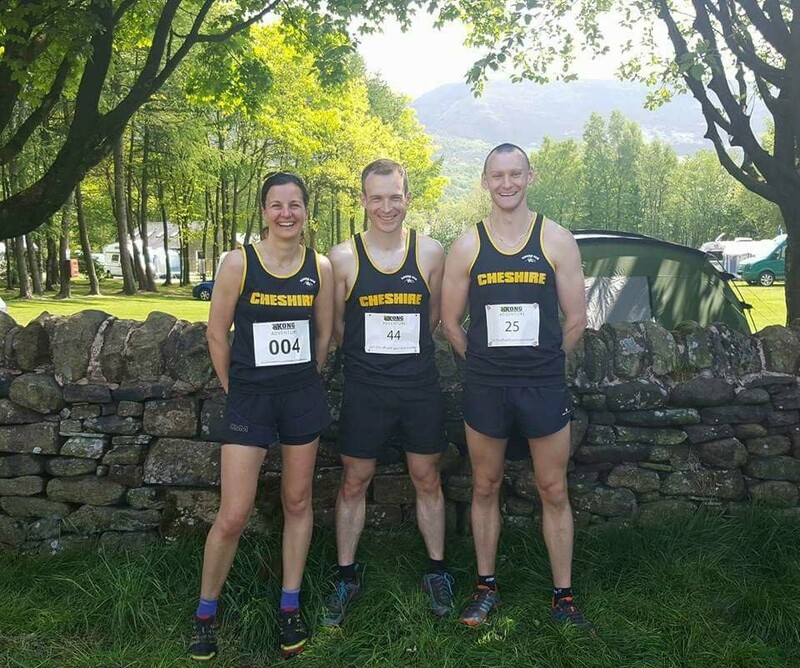 • To have some fell racing experience, it is ok if you are not that confident we can put you on one of the shorter legs or match you with a more experienced runner. Once we know who is interested we will put the teams together. The first is the North West Counties Road Relays, which is being held at Delamere Forest on Saturday 8th September 2018, first race at 10.10am. The North West Road Relays were due to be hosted by Greater Manchester this year, but they were unable to provide a suitable venue so Cheshire has stepped in at the last minute to ensure the event goes ahead. There are more details on the attached prospectus. We am looking for officials to help at the start, finish and take-overs. Please let me know as soon as possible if are available. Age Groups as at 31 August 2018. Under 13s must be at least 11 years old on the day. Juniors (U20s) compete in the Senior events. ALL runners must be first claim members of their club for road running; CLUB VESTS must be worn. AWARDS: North West awards to the first eligible team in each event and fastest leg awards in each age category. Each County will decide on the awards for their respective County Championship. Cumbrian Clubs are entitled to enter the North West Relays. 2. Each club is responsible for ensuring all runners used on the day are eligible as described above as 1st claim for road running on the date of competition and their EA affiliation is paid. co-operation of The Forestry Commission, Delamere Forest. Whitefield car park is the nearest to the start and finish area, and the designated car park for the event. Sunday afternoon saw 8 Felsbies travel to Wales to take part in the 2 Hillforts Fell Race. Great to see Mario back racing on the fells, unfortunately, something pinged in his calf and he had to walk the last 2 miles. The race is 9.25 miles (15k) long with 2000 ft (516m) ascent and covers the two bumps along from Moel Famau – Penycloddian and Moel Arthur. Although classed as a fell race, it’s more like a hilly multi terrain race with quite a lot of Tarmac, some fields, cart tracks, woods, wide grassy tracks and just the one technical descent amongst bracken and heather. The route was very scenic with some beautiful views and was well marshalled at main turnings and well marked with tape at the more remote, however there were a couple of very long pathways which, although it seemed obvious which way to go it could have done with a bit more tape to reassure you that you were going the right way, especially if you couldn’t see the runner in front. The admin however was shambolic. Entry to the race varied depending which site you used – the organiser’s said pre entry only and the Welsh Fellrunners site said entry on the day (as it happens both were valid) We decided to pre enter but that may have been a mistake as there was a software malfunction and it seems that the online entrants data was incorrect. Chris and I were down as F40, Sue was a senior, several were unattached, one of our emergency contacts got an email thanking him for entering the race – and so the list went on. Consequently, although Chris finished 1st F50 (4th lady overall) and I was 1st F60 we missed out on the wine or chocolates. 81 runners took part – 52 male and 29 female. This is a lovely race organised by Spectrum Striders. Starting and finishing in Forest Park (2 minutes from M62 j11) it’s a flat, multi terrain route, mainly on traffic free tarmac or packed earth footpaths through grasslands and woods with a short stretch on road. All abilities – last year the winning time was 19 minutes and the last runner home took 55 minutes. Usual age category prizes. All finishers get flowers and if you stay behind and put your number in the box there’s 20 lucky dip prize winners, last year it was running socks. The park has a children’s playground, a large playing field and a small outdoor gym-perfect for a family outing. It would be great to see lots of green vests there, especially the less experienced of you – it’s an ideal race to start you off, not too big (about120 runners) well marshalled so you won’t get lost, family friendly venue, flowers, water but maybe most importantly for the more timid among you, no competitive men 😉 Dare I suggest picnic blankets, a glass of bubbly and some nibbles to celebrate green army under our flutter flag at the end? Below is the full list of trophy winners from last nights annual presentation evening TrophyFest. Thanks for making a great #greenarmy celebration of running evening and well done to everyone on every counter you’ve ran. Here’s to even more in 2018/19!! Special thanks to Dave & Lesley for the excellent BBQ and Chris for the music. The next couple of weeks of Monday & Wednesday training sessions I will be giving mini presentations before the start to those who could not make it last night. This blog will be the last you recieve if you have not acted on the recent emails about opting in to continue receiving them. If you want to check, please click on the ‘update subscription preferences ‘ link at the bottom of the email, if the box labelled email in the permissions section is ticked, you will continue to receive. If it is not, you won’t. You can tick or untick depending on what you want. 7 Helsby runners made the trip east to Glossop on Saturday for the Inter Counties Fell Champs race, Lads Leap. 3 swapped their green vests for the black and yellow of Cheshire to race against other UK counties. The races were split into a women’s and men’s race. The ladies set off at midday on a scorching day – the race is an out and back course which I am never of a fan of – hard to enjoy the descent when you know you are going to have run back up the same way very shortly! It does allow you to see the race leaders though – as they ran past I did have the overriding thought that the leaders were half my age. Not used to seeing such youth at a fell race!! The heat and less than a week after a hilly marathon didn’t provide my best performance but it was privilege to represent Cheshire and an experience to race against some very quick runners! The Cheshire ladies came 12th (out of 14 and ahead of Merseyside!) and a big thank you to Sue and Rachel for coming to race and support, especially as the number of non counties runners was very low! Well done to Rachel for winning her category. The Cheshire men came 14th (out of 18, and just behind Merseyside!) and thank you to Jimmy and Ben for racing and supporting the men. And of course thank you to Joe and Mario for supporting. Work took me to Middlesbrough this week, and so I scouted the FRA website for any suitable local races. I hit on the Roseberry Romp which looked like my kind of run at 5.1 miles and 1050ft climb. Organised by the National Trust, it climbs Roseberry Topping which is an odd looking hill just south of Teesside. On registering, there were plenty of fellrunning club vests around but also many runners without club colours, so I was reassured that I wasn’t going to be totally out of my depth. The atmosphere was very like our local short fell races – very informal and friendly, lots of people spotting my vest and asking where Helsby is – clearly news of the #greenarmy hasn’t made it to Teesside. The race itself was good fun – I had no idea what to expect, so made a mess of the pacing. I hung back at the start and got caught in the back of the pack, not realising that most of the course was single file trail paths where passing was very difficult. I’d expected the route to be steep from the off but it wasn’t, the initial stages were mostly woodland trail with gradual climb, then there were steep climbs up Roseberry Topping itself and Little Roseberry, which isn’t much ‘littler’ than the main hill. The descents were on paths paved with rough blocks where it was hard to get any kind of rhythm, though the paths became easier lower down the hillside. The hill is high enough that it was in the clouds, so no views but it was nice and cool. I stayed for the prizegiving, which was lucky as I got a spot prize of a pair of socks worth more than my entry fee, so winner! Results will be on the NT Roseberry Topping facebook page apparently, no sign of them yet. Kate Mann wrote this report for the Liverpool RnR marathon. I was hopeful, though not very confident, of a sub-4 finish (starting in corral number 2, I was more than a little concerned that I had very much over estimated my finish time when registering!!). I love the city of Liverpool and the route takes in all of the sights including a lap around Everton’s Goodison Park and then (annoyingly for me) followed by a run through the foyer of Anfield. It then returns back to the city centre before heading out towards the city’s parks. The support around the course was great particularly in and round the centre, and there was plenty of water and gels available – a big relief considering how hot it was that day! The added benefit of the RnR series is the selection of bands and DJs around the route, which definitely adds to the atmosphere of the day! The last 3 or 4 miles follow the Otterspool Promenade and although it is flat, it just seems to go on for forever and ever, and unfortunately not even a breeze off the Mersey to keep us cool! I decided at around 7 miles that I would stick like glue to the 3:45 pacers for as long as I could and found myself making friends with one of them (who I think was Italian) and he hilariously kept telling me off every time I looked at my watch or used a gel (both completely unnecessary he told me), as well as shouting at me to shorten my stride every time we went up hill at all. I found myself dropping just behind him every now and again to sneak a gel without him noticing!! He was such a great help though and kept me focused in the warm conditions. After we hit 22 miles or so, I started to drift ahead of the pacers and finished in the official time of 3:37:44 (3:38:20 according to my watch) – a marathon PB of over 30 mins. Overall, I (weirdly) thoroughly enjoyed the race and think the RnR races are loads of fun and well organised – remains to be seen whether I will enter any more marathons though! Big well done also to the other Helsby runners I saw on the day – Paul, Tim Ste!